PNCWA Scholarships Applications Deadline for 2019 Cycle is Feb. 15, 2019 for preferred action, March 15 final deadline. The application is all online. You may edit your application through March 15, 2019. If you have questions or difficulty completing your application, please email [email protected] and we will try to assist you! You may preview the application before you begin the form. When you preview the application, you will see essay questions that apply to both "Engineering/Environmental track students", and to "Operations track students". But Relax! you only are asked to complete the question for your particular study track! 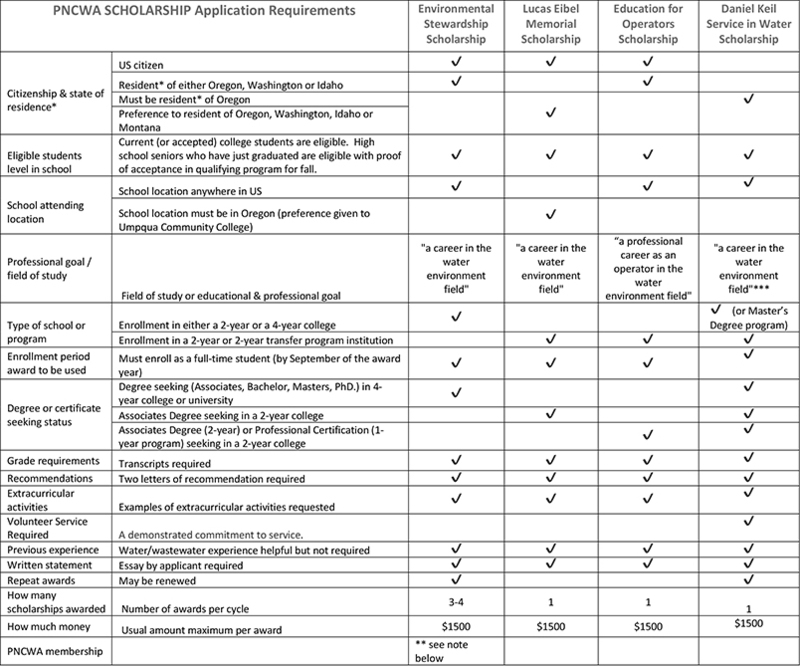 Compare the application requirements for all scholarships in this table: Download this scholarship comparison table here. Daniel Keil Service for Water Legacy Scholarship Description: This scholarship is available for applicants intending to pursue a career in the water environment field. One scholarship will generally be awarded, normally valued at $1,200-$1,500 each, with emphasis on either 2-year or 4-year degrees or enrollment in a Masters program. A demonstrated commitment to service is required. The applicant must enroll as a full-time college student (by September of the award year) that allows the applicant to pursue a professional career (e.g., engineer, operator, lab analyst) in the *water environment field. Official proof or transcript of grades from high school or college. Essay (800–1,000 words) on volunteer service experience and how the applicant has integrated that experience into career goals related to the water environment. A demonstrated commitment to service. All service is considered. Service to the community and/or service to under-served or disadvantaged communities including (but not limited to) under-developed countries and/or economically disadvantaged communities either within or outside the United States carries additional weight. Applicants do not necessarily need to come from under-developed or economically disadvantaged communities. However, Applicants should be able to demonstrate how people in under-served or economically disadvantaged communities have benefited from the Applicant’s volunteer service. Preference to residents Oregon, Washington, Idaho, Montana, but residents of any geographic location may apply. May be attending or plan to attend a school anywhere in the U.S.
Career Objectives and Environmental Interest essay on volunteer service experience and how the applicant has integrated that experience into career goals related to the water environment. Demonstrated commitment to service. All service is considered—Consideration will be given for the strength of an Applicant’s service relative to the Applicant’s opportunities for service (e.g., a high school student’s volunteer opportunities could be more limited to those of a college student). For applicants who are prior PNCWA scholarship recipients, an additional Award Renewal essay is required. * Water environment academic programs may include civil, environmental, and bioresources engineering; environmental studies; environmental law; water and/or wastewater operations; and laboratory analyses. Mechanical, chemical, structural, or other engineering and technical disciplines, and environmental pre-law, will be considered on a case-by-case basis, provided the Applicant demonstrates how her/his field of study and career plans relate to the water environment. Environmental Stewardship Scholarship Description: This scholarship is available for applicants intending to pursue a career in the water environment field. Three scholarships will be awarded, normally valued at $1,200-$1,500 each, with emphasis on both 2-year and 4-year degrees. At least one scholarship award will be given to a PNCWA member or a member’s family member. The applicant must enroll as a full-time college student (by September of the award year) that allows them to pursue a professional career (e.g., engineer, operator, lab analyst) in the water environment field. Essay on career goals related to the water environment. A minimum of two letters of recommendation—one must be from a teacher or professor, the other must be from someone not related to the applicant. May be attending or plan to attend a school outside of Oregon, Washington or Idaho as long as permanent address (i.e. parent's address) is in Oregon, Washington, or Idaho. May be attending a school within Oregon, Idaho, or Washington, and have completed at least one year at said school, and is or will be continuing at a school within Idaho, Washington, or Oregon, and has established a practical physical year round residence in one of the said states, even though student originally came from out of state, and parent still resides out of state. (Examples of practical year round residence means that the student does not return to an out of state home each summer, and instead continues to reside within the state such as for work when not in school. In conjunction with the requirement for having completed one year of school within one of the appropriate states, filing state taxes within Oregon, Washington, or Idaho; or having a driver license from Oregon, Washington, or Idaho are further examples of having established practical residency. Out of the three awards, one is reserved for an applicant where the applicant or an immediate family member of the applicant is a PNCWA member in good standing for at least one year. For applicants who are prior award recipients, an additional Award Renewal essay is required. Lucas Eibel Memorial Scholarship Description: The Umpqua Basin Operators Section (UBOS) has established this scholarship in the amount of $1,500 and made it available to community college students in a 2-year or 2-year transfer program. Lucas Eibel was a summer intern at Roseburg Urban Sanitary Authority (RUSA) and a UBOS member who was lost to the shooting tragedy at Umpqua Community College (UCC) on October 1, 2015. Preference will be given to UCC students for this scholarship, but applications are open to students throughout the State of Oregon. The applicant must enroll as a full-time college student (by September of the award year) that allows them to pursue a professional career (e.g. Engineer, Operator, Lab Analyst) in the water environment field. Education for Operators Scholarship Description: The Umpqua Basin Operators Section (UBOS) has established this scholarship in the amount of $1,500. This scholarship is intended for an operator seeking a 1-year certification program or a student enrolled in a 2-year program. This scholarship will be awarded in the amount necessary for the program in which the applicant is enrolled up to $1,500. The applicant must enroll as a full-time student (by September of the award year) that allows them to pursue a professional career as an operator in the water environment field.